In Kistishi Island by Jordan Elizabeth, Serena has always been an outsider, but she doesn't mind because she has four best friends that always look out for her. Too bad no one else can see them. Not the bullies that won't leave her alone, or her aunt that doesn't understand, or her mom who's never there. It would make life simpler, but she won't give up her friends for anything. Her week goes from bad to worse when she gets expelled for fighting and her mother decides to go on an archaeology expedition to Kistishi Island instead of returning home. After Serena is attacked at home, she decides to run away to join her mother, but she doesn't expect the danger that awaits her there. The island holds many secrets, ones that her mother has been hiding from her for years. As she learns the truth about the island, she discovers shocking secrets about her supposedly imaginary friends and uncovers a threat that could take them away forever. Serena is constantly bullied, no one will believe her, and she feels neglected and ignored. Everything just gets worse and worse, acting as a slow set up for what finally pushes her to run away to the island. Serena feels very alone as the only characters that she has a real connection with are her four friends so it's easy to attach to them. Her friends are the key to the secrets of the island, as well as the mystery of why Serena is seeing them. Her aunt is the only real support system she has, but she also is a main antagonist to Serena because she refuses to believe her, yet there's a lot of sympathy for her. She truly cares about Serena and does her best, but she doesn't know quite what the best is. Her mother is less sympathetic, because she just leaves and seems to care more about her job than anything else. It's easy to understand what would drive Serena to run away and this makes for a complex dynamic between the three of them. Krieg is one of her “imaginary friends,” but is also one of the most complex characters. She's pro war and uses that as her answer for resolving any sort of conflict, but she's also loyal and free spirited with a spunky quality about her. She's the main one that Serena connects with, but also the one that makes her stronger and more independent. 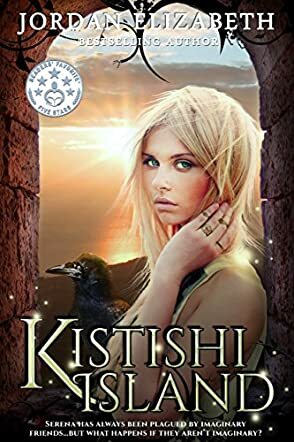 Kistishi Island by Jordan Elizabeth is a coming of age story filled with adventure, danger, and a rich mythology. The island is gritty and has a darkness to it, containing a lot of secrets that are hidden deep within, but there's also a certain amount of beauty there. Jordan Elizabeth creates layered characters that are well-rounded and detailed. At the heart of the story is Serena's personal journey to prove herself, which is tied to the mysteries of the island and her friends. Kistishi Island is a mystery that, as it unravels, reveals many more mysteries to discover, with a satisfying conclusion, complicated characters, a dangerous mythology, and high stakes that will keep you turning the pages.